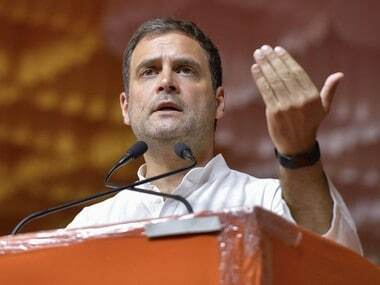 Madurai: Taking a veiled dig at prime minister Narendra Modi's radio talk programme, Congress president Rahul Gandhi Friday said his party's manifesto was not the "Mann Ki Baat of one megalomaniac" but talked about work of the nation. He invoked Tamil pride in his election rallies at Krishnagiri, Salem, Theni and this temple city, assuring the people of Tamil Nadu that his party listens to their voice. This was reflected in the assurance in the party's manifesto to not impose NEET, which is strongly opposed by Congress allies, including DMK, he said while highlighting his party's showpiece minimum income guarantee scheme "NYAY". As many as 22 lakh jobs in the government sector, ten lakh jobs in panchayats, 33 per cent quota for women in central government jobs and reservation in Parliament and state legislatures were among other key assurances. 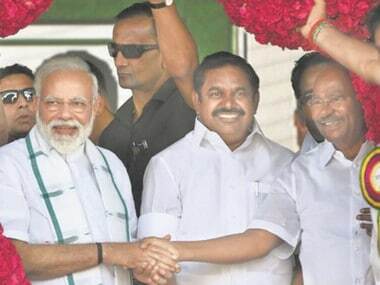 Accusing the Prime Minister of not having the "decency", to listen to Tamil Nadu farmers when they protested in Delhi in 2017, Gandhi said he, however, met them and "hugged them," and assured to listen to them. The Congress, if its comes to power, would ensure that every single farmer will be apprised of what the central government intended to do for them at the start of the year like the extent to which the Minimum Support Price will be raised, and compensation for crop damage, he said. "We will make it illegal to put any farmer in jail for default on loan," he said. The election of 2019 was a clash of vision between two different ideologies, he said. While his party stood for unity in diversity and "all voices must be heard," Gandhi said the RSS and BJP say that only one idea should govern India. 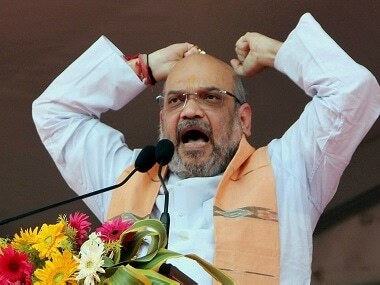 Hitting out at BJP, he said they obviously have not read the history of the Tamil people. "They don't understand Periyar, Karunanidhi (Dravidian stalwarts) and Kamaraj." 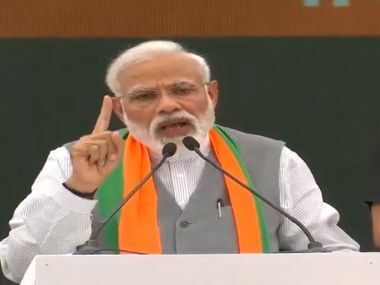 He claimed demonetisation and GST 'destroyed' the small and medium industries in Tamil Nadu and 30,000 MSMEs had to shut down and "50 lakh jobs were lost." "We are going to defeat Narendra Modi in the coming election and after a while (DMK president M K) Stalin is going to be the chief minister of Tamil Nadu as well," he said reiterating his earlier assertions. Gandhi assured the middle classes will not be burdened to fund the Nyay scheme and indicated it would by taxing the super rich. "I want to make it cryctal clear to middle classes that the money is not going to come from you. Modi has been giving thousands of crores to his favoured few....that is where the money is going to come from. There is no shortage of money in this country," the Congress chief said. Senior leader P Chidambaram alleged Dalits and minorities lived in fear, economy lay in tatters and societal peace was disturbed and the nation faced a huge threat on India's internal security. Earlier, in the Salem rally, Stalin alleged the AIADMK government did not allot space in the Marina beach for burying late DMK patriarch M Karunanidhi last year and his party had to approach the Madras High Court to get permission. He hailed Congress manifesto as the super hero, his party's manifesto hero and BJP's manifesto as "zero." Referring to Stalin's remarks Gandhi said, "your father was not an ordinary person, he represented the voice of the Tamil people." And, hence, it was an insult of the voice of the Tamil people. He mocked at Modi's "Make in India" slogan, saying the country's market was now flooded with Chinese products. Modi had hurt the youth in the last five years, giving "huge amounts of money from the banks to the richest people but not to them." "He gave you an empty slogan called Make in India but wherever we look we see Made in China products," he said. He referred to the Congress' proposal for entrepreneurs and said they no longer have to take permission from any government department for first three years after starting their business. 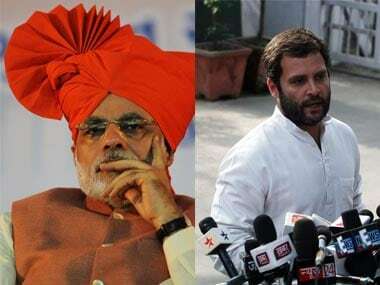 Accusing Modi of running his government for 15 of his friends, Gandhi said he wondered why no big-ticket defaulters of bank loans like Vijay Mallya were not in jail. The Congress chief said fugitives like Nirav Modi and Vijay Mallya, after taking bank loans, failed to return it and ran away from the country. Gandhi said if his party was voted to power, no farmer "is going to be put in jail for not paying back his bank loan, it is not fair that the richest people do not go to jail but farmers go to jail for the same offence".